The 2005 Amman bombings were a series of coordinated bomb attacks on three hotels in Amman, Jordan, on 9th November 2005. Al-Qaeda claimed responsibility for the attacks, which killed 60 people and injured 115 others. At the Radisson SAS Hotel, two suicide bombers – a husband and wife team – entered the Philadelphia Ballroom, where 900 Jordanian guests were attending a wedding. The woman suicide bomber planned to detonate a suicide belt, hoping survivors would flee towards her husband at the door of the room, allowing him to detonate and kill more of them. But the female suicide bomber’s device failed to detonate. Her husband admonished her and told her to get out of the room. After she left, he jumped onto a dining-room table and detonated himself. Amongst the 38 people killed in the explosion were the fathers of the bride and groom. In addition, the explosion destroyed the ballroom, blew out the large windows bordering the street, and knocked down ceiling panels. The hotel lobby was also affected: ceiling panels and light fixtures collapsed, furniture was destroyed, and the hotel’s glass doors were shattered. The second blast occurred at the Grand Hyatt hotel. The bomber ordered orange juice in the hotel’s coffee shop, then left and returned wearing a suicide belt packed with ball bearings, which he detonated. The blast brought down pillars and ceiling tiles. It killed nine people instantly. Two senior Palestinian officials were among the dead. At the Days Inn a suicide bomber detonated his device in his car after he tried unsuccessfully to crack the concrete security barriers surrounding the hotel. Three Chinese guests were amongst those killed. 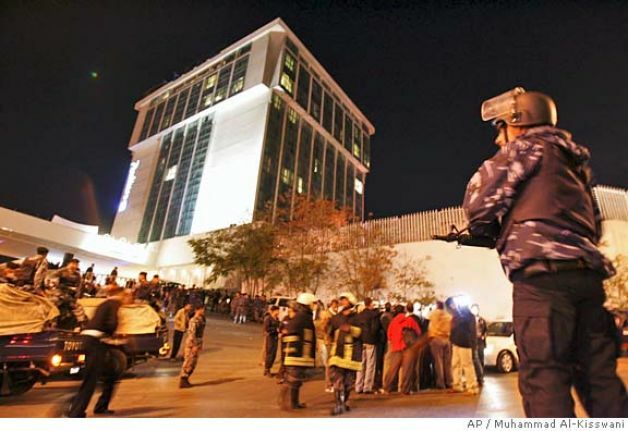 Bassam Banna, deputy general manager of the Radisson SAS hotel in Amman, who witnessed the horrific aftermath of the blast, later described the incident as follows: “I received a call around 2100, saying that something had happened in the hotel’s main ballroom. I didn’t know what to think – it could have been anything. I just didn’t know. But when I got there I walked into carnage. I could tell it had been a huge bomb blast. There were casualties everywhere; the fire brigade was there along with ambulances. Someone had slipped into the wedding among the guests and later there was this huge blast. I don’t think anyone even saw him, not until it was too late. It was total chaos, we were really horrified. A lot of the staff were wandering around with all their clothes bloodstained from helping casualties. I feel extreme anger that this happened. These people who have been killed were pure innocents, local Jordanians. So many have died, but we will not be defeated by this. At the hotel today, we had demonstrations from local people condemning terror. They are waving flags outside, chanting against terror, saying “We will not be defeated”.